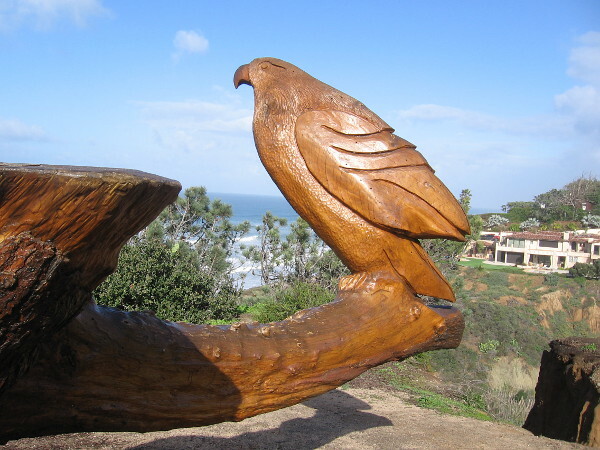 wood carving – Cool San Diego Sights! 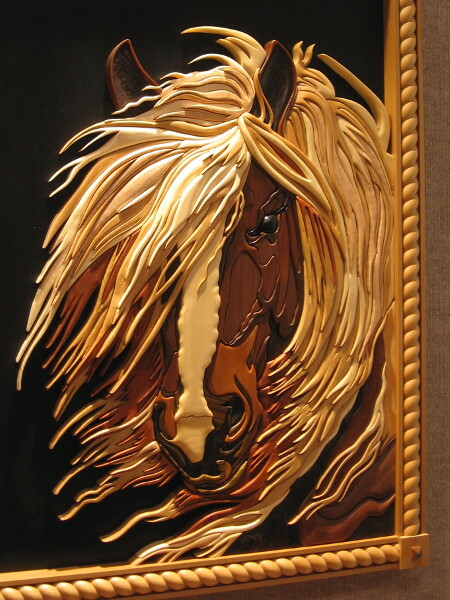 Amazing photos: Fantastic, incredible wood art! 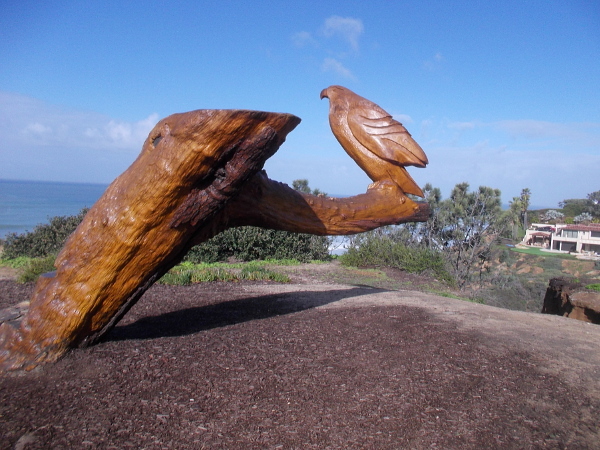 Amazing wood art. 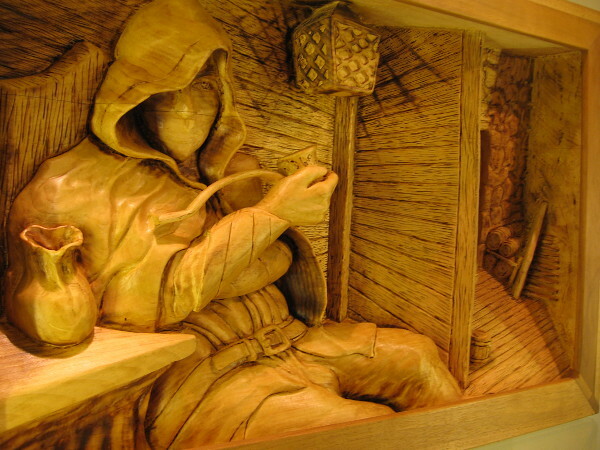 A hooded figure takes a break at an inn. Just Off The Road, Basswood, Randy Stoner. 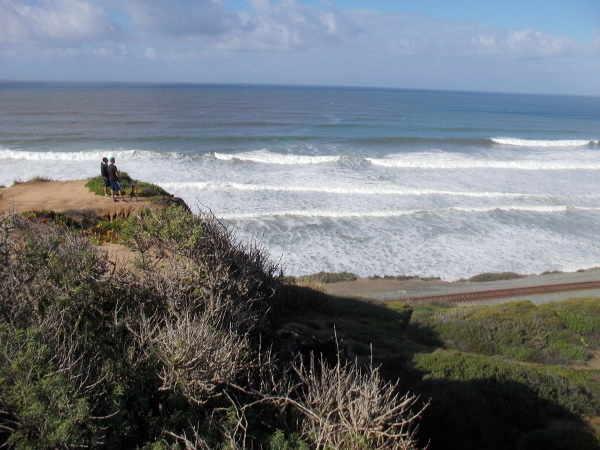 Today I moseyed around Del Mar and Solana Beach. 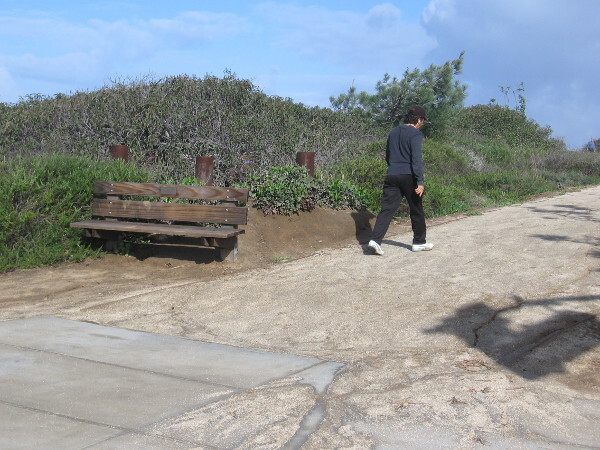 My walk included a couple of stimulating hours at the San Diego County Fair. I just wandered about, soaking it all in, and found my feet heading toward my favorite part of the fair, the Design in Wood Exhibition. 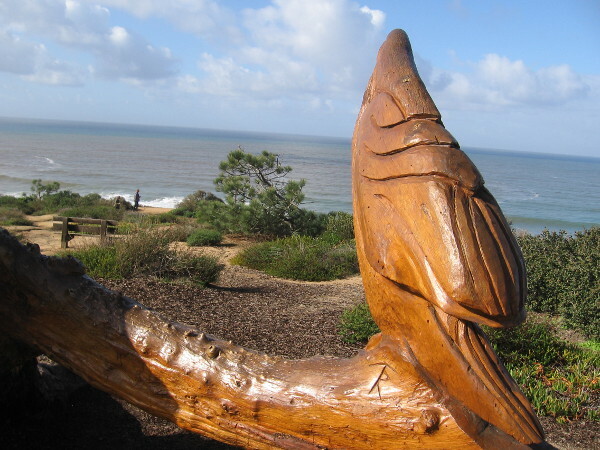 Some of the best wood artists in Southern California–the world, for that matter–submitted their incredible pieces this year to be judged. 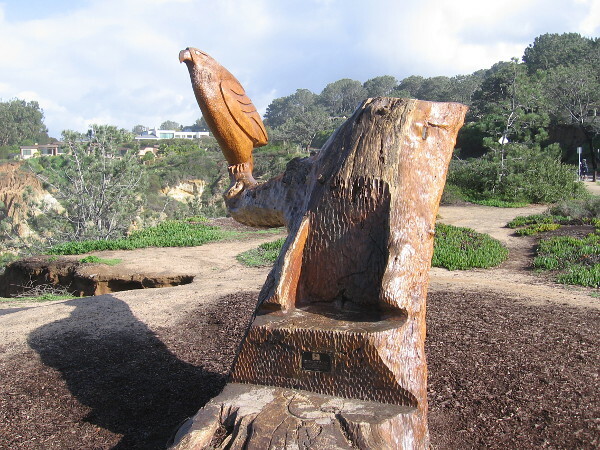 The exhibition, a collaboration with the San Diego Fine Woodworkers Association, is celebrating its 35th year. 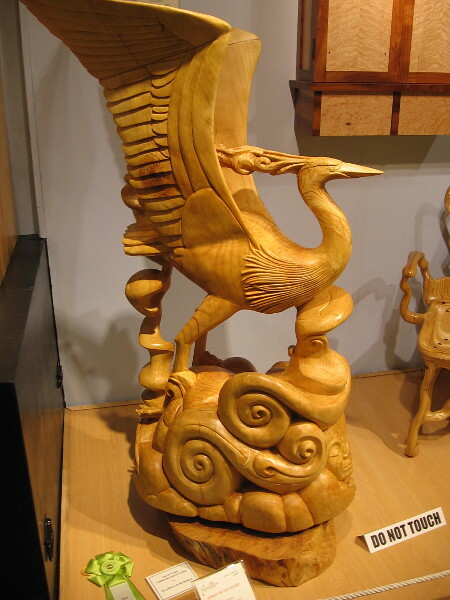 Here is some of the wildly creative woodwork that really caught my eye. You’ll notice many pieces have an Alice in Wonderland theme. That’s because this year’s San Diego County Fair is all about that timeless children’s book penned by Lewis Carroll. 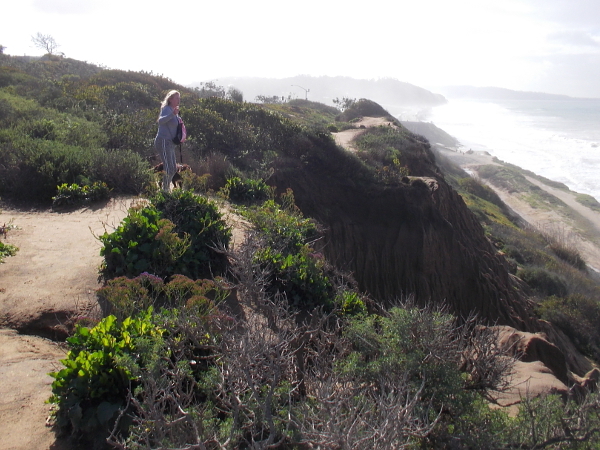 White Rabbits, March Hares and Mad Hatters abound! Everywhere you turn there’s a tea party or a grinning Cheshire Cat! 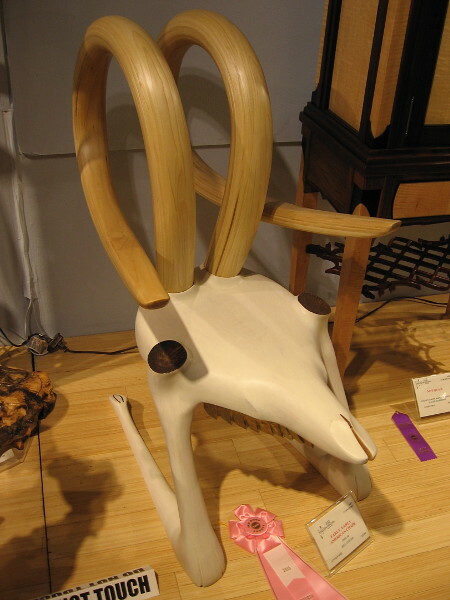 The Alice in Wonderland theme intersects with Steampunk, of course, so many fantastic contraptions and quirky bits of wood art are included in the exhibition. Take a look! 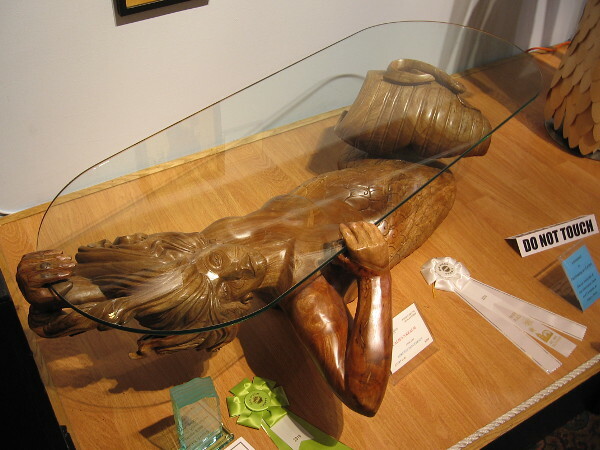 Glass table supported by fantastic underwater character carved from wood. Califa’s Realm, Avocado, Lorenzo Foncerrada. 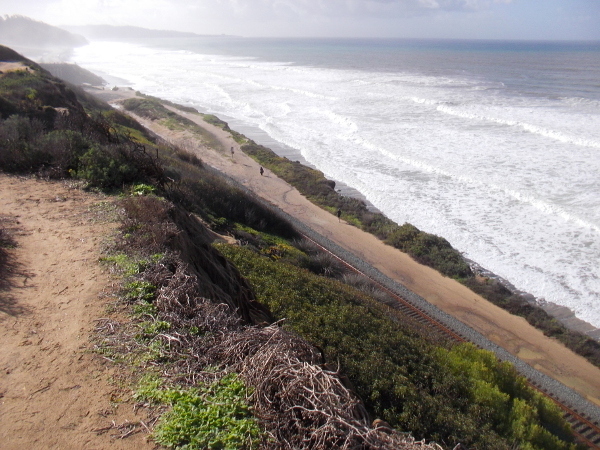 A steampunk writer might enjoy creating new worlds while sitting here! Time Machine Desk, Recycled Pine and Plywood, Jeffrey Comulada. Yikes! 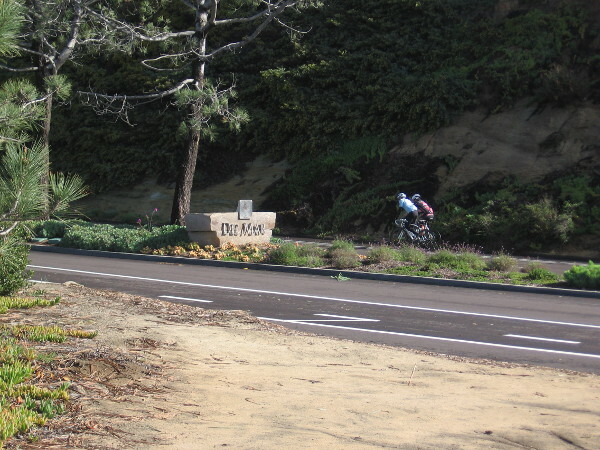 Get out of the way! This eye-catching contraption is just too cool. 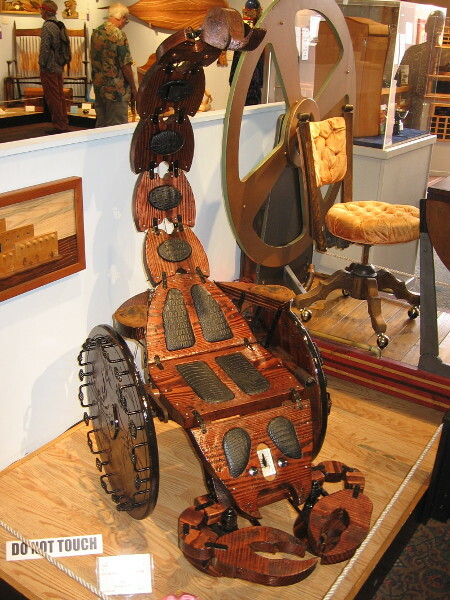 Scorpion Wheelchair, Pine, Roger Aceve. 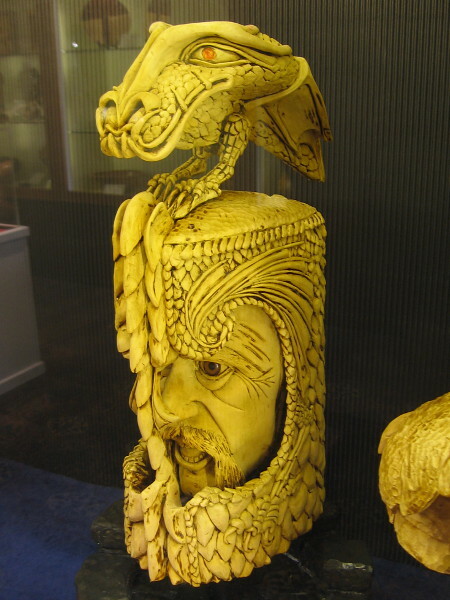 A truly amazing fantasy woodcarving. Julia the Dragon Killer, Bass, Antonio Barrios. 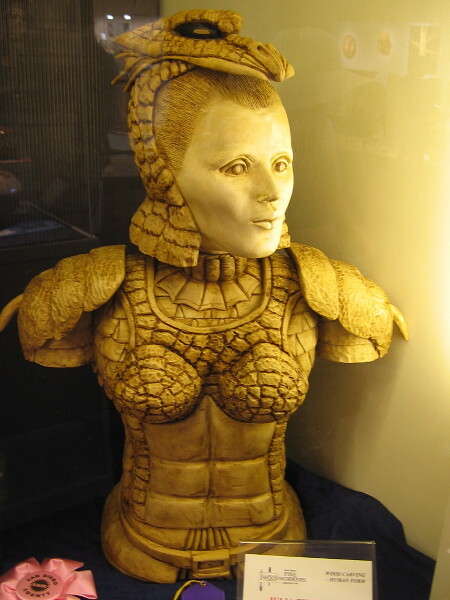 Ancient warrior and an incredibly elaborate helmet made of wood. Dracon Soldier, Bass, Antonio Barrios. More outstanding artistry. Heron in a scene from a San Diego lagoon. 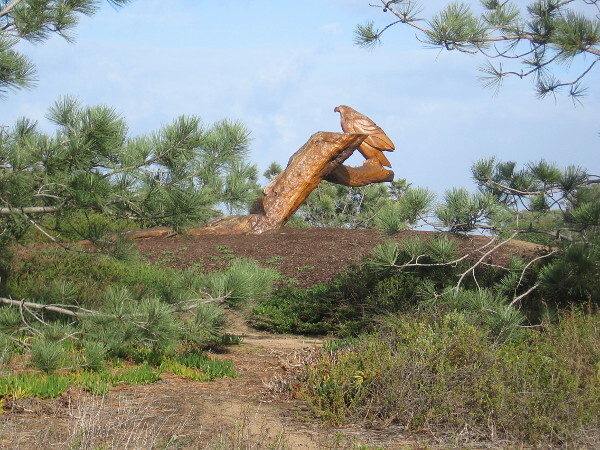 Spirit of San Elijo, Torrey Pine, Lorenzo Foncerrada. 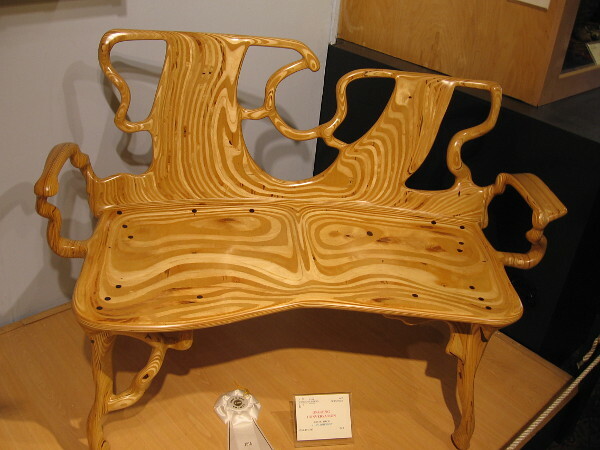 Wood grains flow in this crazy organic bench. Ongoing Conversation, Baltic Birch, Alan Johnson. 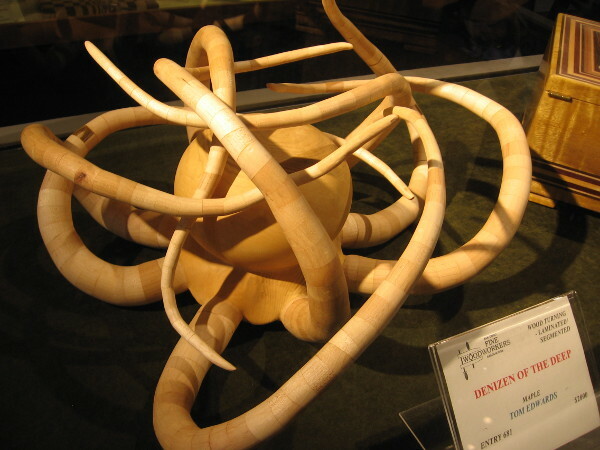 A very cool tangle-tentacled wooden octopus. Denizen of the Deep, Maple, Tom Edwards. 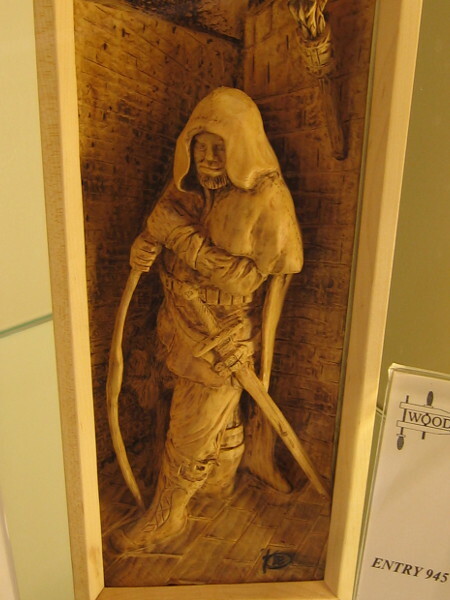 Perhaps this is a wood version of Strider from Lord of the Rings. Ranger, Basswood, Randy Stoner. 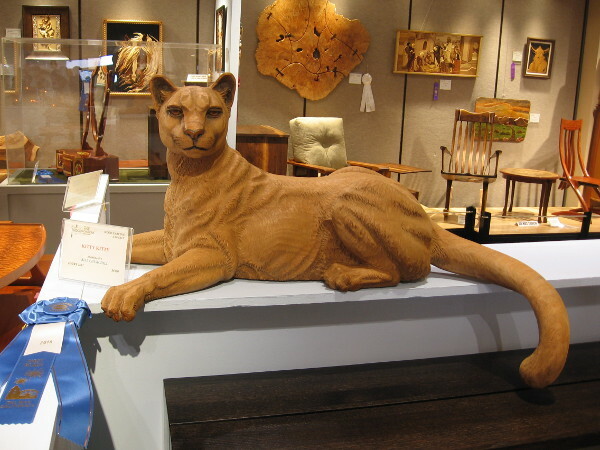 A mountain lion carved from wood keeps guard among other spectacular works of art. Kitty Kitty, Mahogany, Bill Churchill. 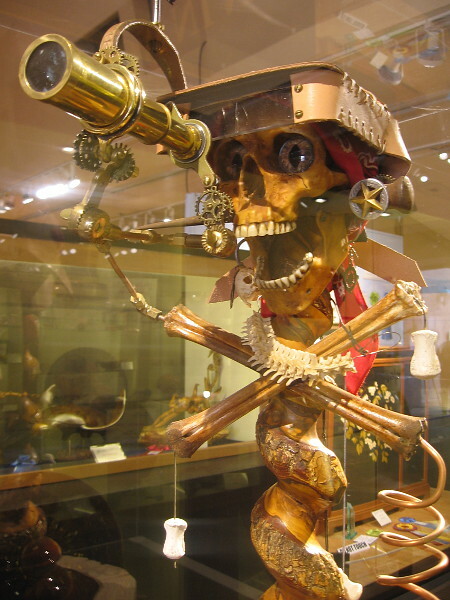 This skeleton pirate with a brass steampunk telescope is beyond awesome. Mutiny, Bloodwood Fir, Mike Anderson. 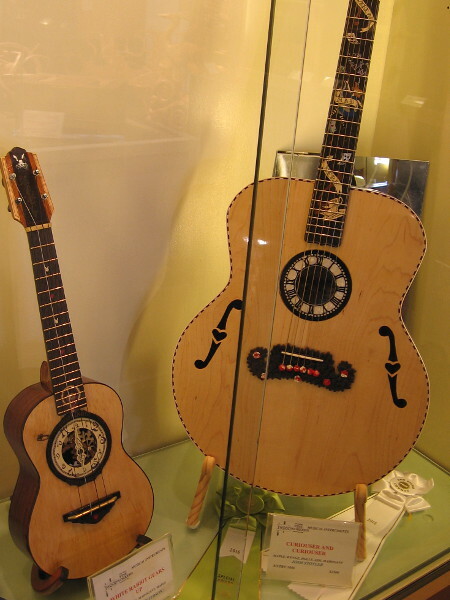 Two very cool handmade guitars with an Alice in Wonderland theme. I see clocks, the White Rabbit, a mad tea party, even a mustache! I love this example of imaginative wood design. 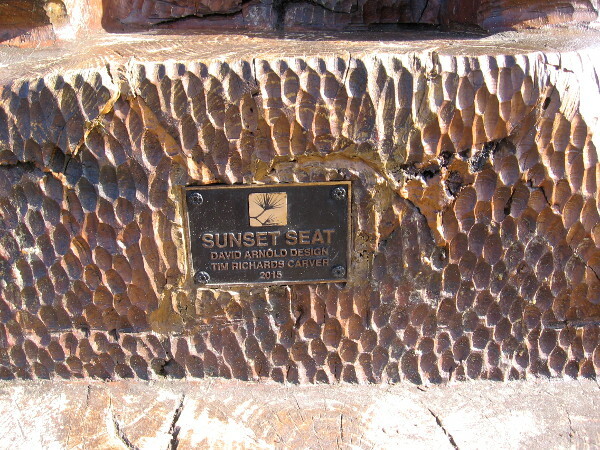 Jack Rabbit, Alder, Ray Camien. 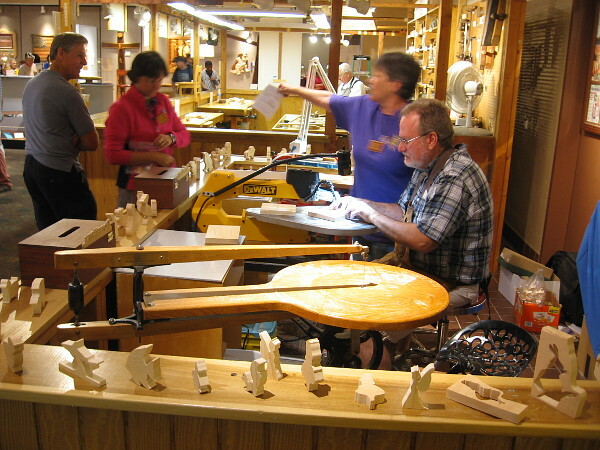 Members of the San Diego Scrollsaw Clubs demonstrate their craft to people visiting the Design in Wood Exhibition at the San Diego County Fair. A wonderfully inventive piece of furniture. 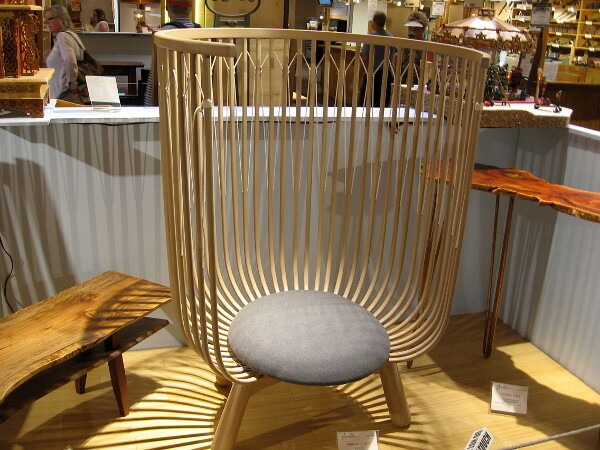 Birdcage Chair, White Oak, Patrick Atangan. Looks like an animal skull in the desert Southwest. Early, Early American Chair, Poplar, Del Cover. 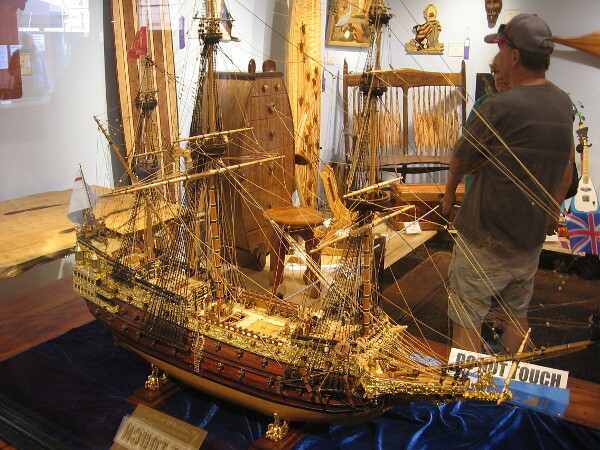 This might be the most intricate model tall ship I ever saw. 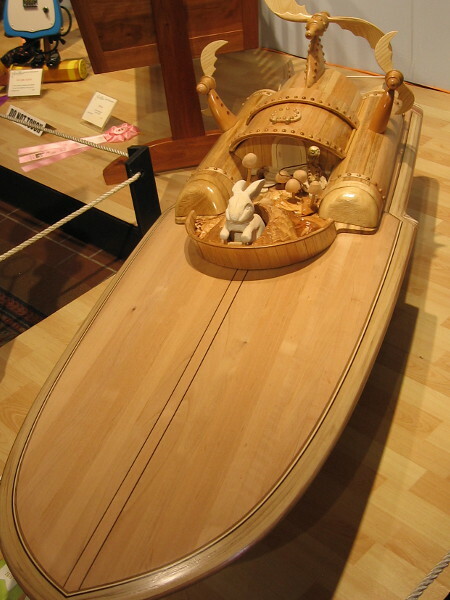 Sovereign of the Seas, Boxwood, Mahogany, Ebony, Sycamore, William Norris. When a person becomes old, there’s no need to become dull. 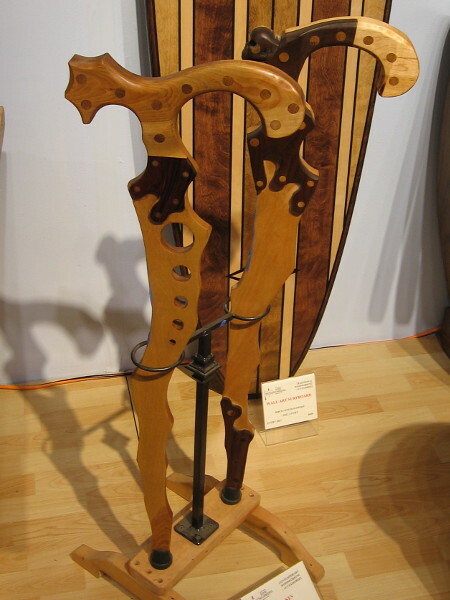 Two Canes, Various, Tracy Talbott. 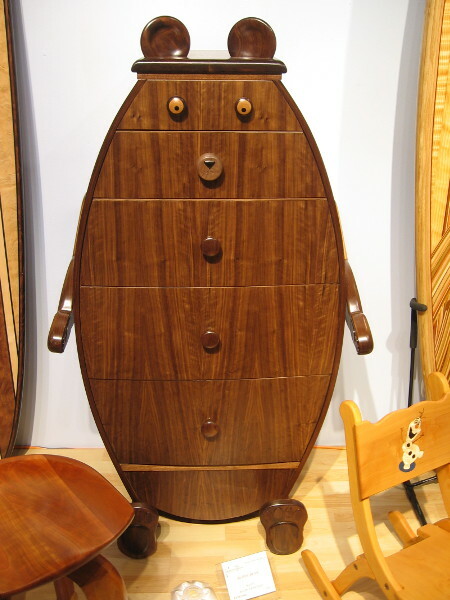 A fun chest of drawers perfect for a kid’s room. Buddy Bear, Walnut, Ralph Crowther. I wonder if Lewis Carroll imagined there would be steampunk powerboats one day. Looking For Alice, Various, Michael Rumsey. I love the cosmic layered wood sky with Saturn behind buildings. 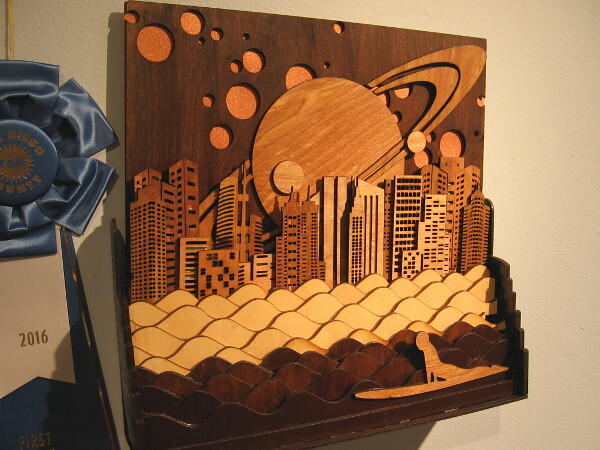 Night Surfing, Hardwood Plywood, Robert Stafford. Gears aplenty. 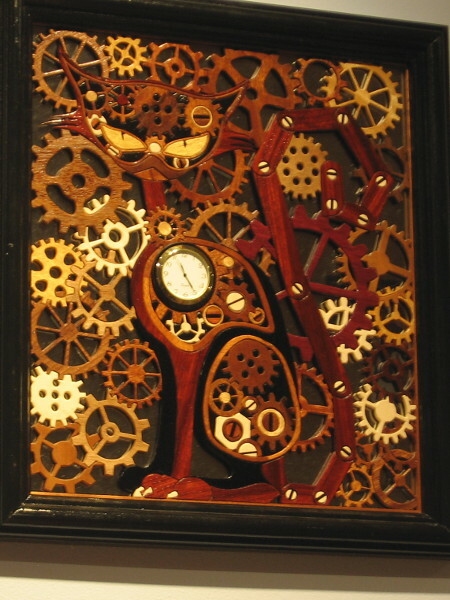 Steampunk Cat, Various, Stephen Knight. 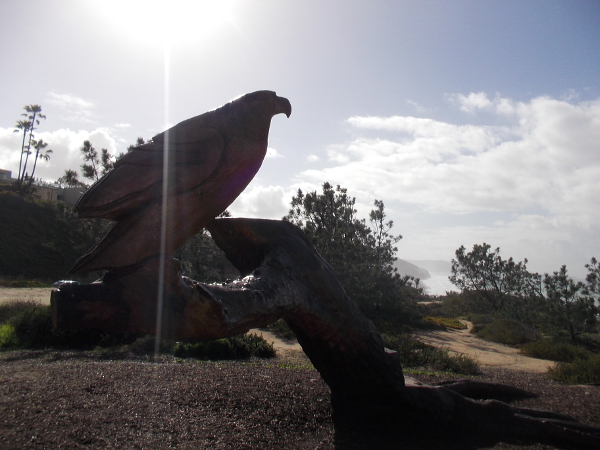 Now this work of wood art totally blew my mind. Absolutely beautiful. Stormy, Various, Chuck Collins. 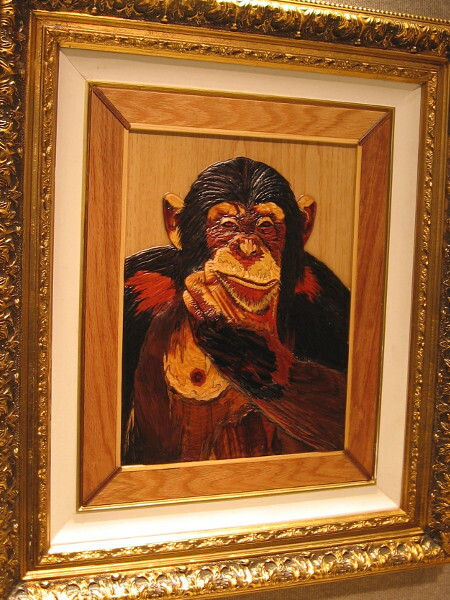 Yeah, some days this pensive chimp could easily outwit me. Thinking, Various, Daryoush Ababaf. Posted on June 5, 2016 Tags alice in wonderland, amazing, art, artists, artwork, crafts, creativity, fantasy, furniture, imagination, inventions, steampunk, wood, wood carving18 Comments on Amazing photos: Fantastic, incredible wood art! 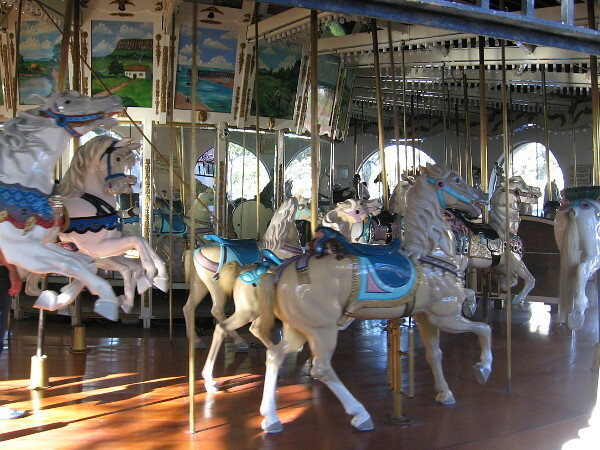 Seaport Village’s historic carousel horses. 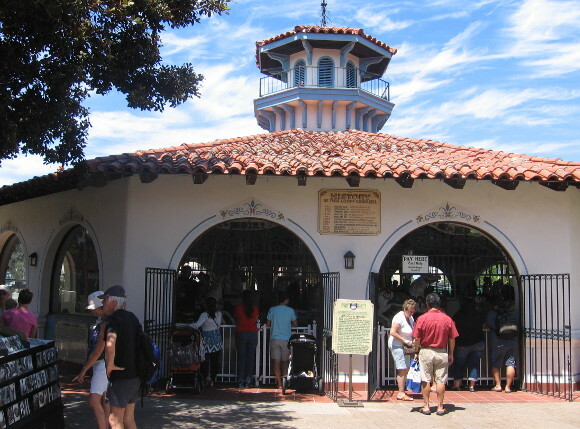 One of the best things about Seaport Village is its historic carousel. I like to buy a hot dog or onion rings from the nearby food court, or an ice cream from Ben and Jerry’s, then sit down at a shady table and watch families and kids flock to the merry-go-round. 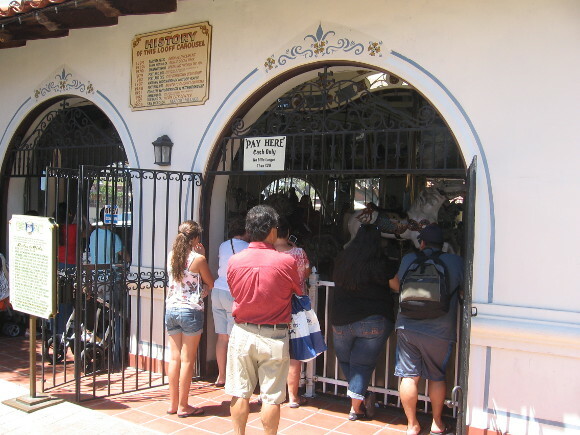 It’s also pleasant to take in a bit of live music from local artists who perform near the carousel on weekends. This fun Looff carousel was built in 1895 and features over fifty colorful animals including a dragon, a giraffe, a teddy bear, a lion, and two horse-drawn chariots. 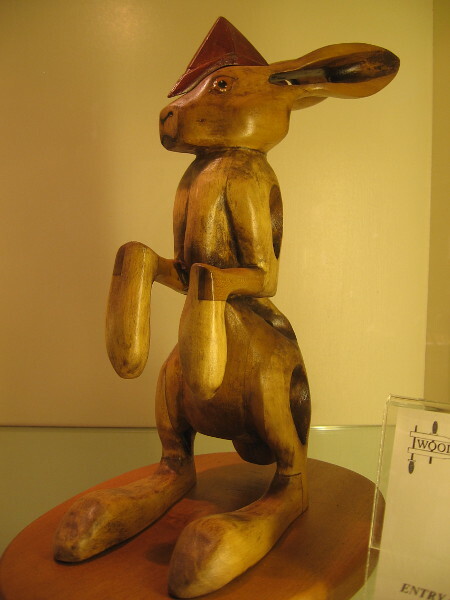 Master wood carver Charles Looff is famous for inventing the uniquely flamboyant Coney Island style of carousels. 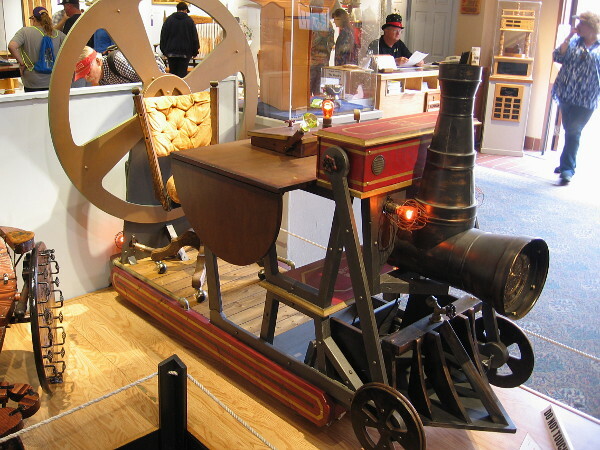 In his lifetime he produced many popular carousels, amusements parks, roller coasters and Ferris wheels. Very cool! 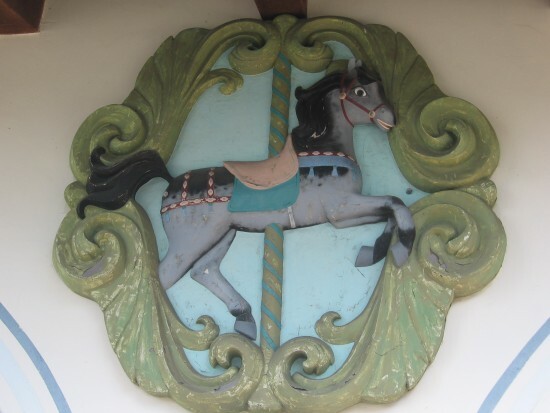 Horse decorates exterior of Seaport Village carousel. 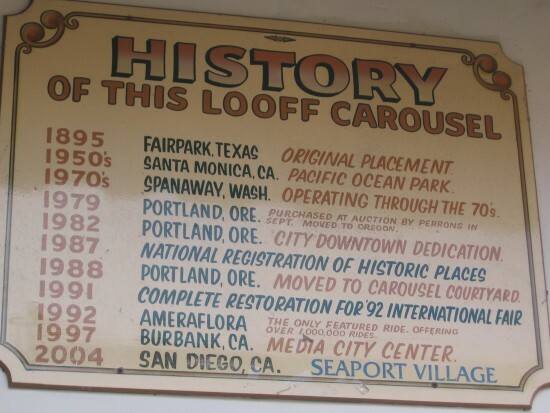 Signs details long history of this Looff carousel. The fun merry-go-round is a big favorite of young and old alike. People enjoy a perfect day near the Seaport Village carousel. Posted on September 18, 2013 December 13, 2017 Tags amusement parks, art, carousels, entertainment, fun, history, horses, kids, photo, san diego, seaport village, tourism, travel, wood carvingLeave a comment on Seaport Village’s historic carousel horses.